a near-total elimination of the state's arts and cultural funding for 2010. Homage to Eisner was (partially) executed and presented at Live Coverage, an annual auction in support of the Urban Institute for Contemporary Arts, Grand Rapids, MI. This fundraiser for West Michigan's largest non-profit arts center seemed an ideal context in which to share concern and encourage action around this issue. Over-sized $100 bills were screen-printed, and the text printed from linoleum blocks on a small poster-proofing press throughout the evening. 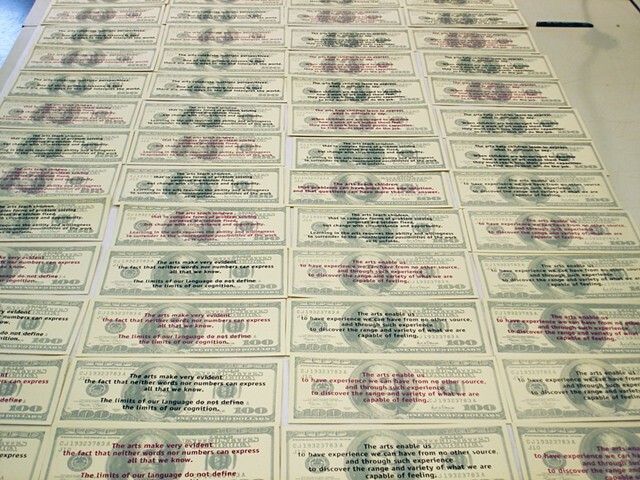 Each bundle of "Eisner Bucks" was accompanied by a written appeal to Granholm, ready to mail or share by phone. Elliot Eisner is emeritus professor of Art and Education at the Stanford Graduate School of Education, widely renowned as a champion of art's integral role in public education and value to society at large. In 15 years of teaching I have yet to encounter a pro-arts argument more succinctly, effectively made than his Ten Lessons the Arts Teach.